The best small cabin energy storage is using deep-cycle, 6-volt or 12-volt batteries. Let’s look at how to pick them, size them and set up your system. We’ll also talk about how to control their charging with an MPPT controller and convert that battery power to useful AC power using an inverter. Once you’ve established your choice of energy production you need to decide how to handle your small cabin energy storage. Unless you can tap into the power grid, that means you’ll be using batteries to store the energy you’ve produced. Wet Cell or Flooded is the traditional battery technology that has been around, unchanged for over a hundred years. It’s cheap and reliable but requires inspection and topping up of the battery fluid periodically. AGM batteries use a glass mat saturated with electrolyte. Instead of a liquid that can be spilled, it’s held in suspension in the mat. 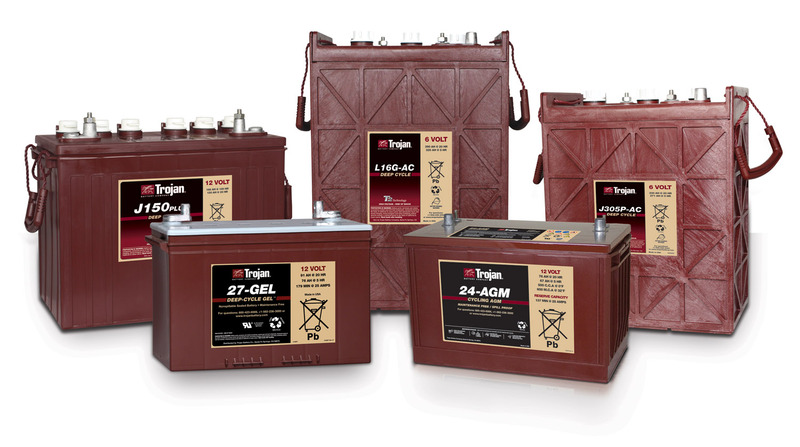 AGM batteries (often mistakenly called gel cells) are good for a quick burst of amps but don’t like being deeply discharged and therefore are not well-suited for these applications. Gel batteries use a gel to suspend the electrolyte and thus there is no leaking if the battery tips over or a cell is broken. They have a different charging profile (see section on charge controllers) that must be adhered to or you will shorten the life of the battery. A deep-cycle battery is one that can be charged and discharged heavily and repeatedly without damaging it. This is what you want for a battery bank used for small cabin energy storage since that’s exactly what you will be doing with it: charging and discharging. The typical battery you have in your car is not a deep-cycle because that’s not what is required. Instead, your car battery is asked to quickly give up its current to start your car, then just floats on the system while it is slowly recharged by the alternator. One of the easiest and most economical choices is to use flooded lead-acid 6-volt golf cart batteries. These are fairly cheap and ubiquitous. The two main companies here are Trojan and Surrette (known as Rolls in the US) and they make 6-volt (which can be connected in series to get 12 volts) and 12-volt deep-cycle batteries. You want to oversize your battery bank so that you don’t discharge your batteries to zero and risk damaging them. Also, on the top end, the last 20% top-off charge on the batteries takes a long time so you may be floating in the middle 40-60% of the battery array’s capacity. If you wire two 6-volt batteries in series you are essentially adding their voltages together, creating a 12-volt battery unit. You would connect a wire between one battery’s negative terminal and the other battery’s positive terminal. You draw the power from the unit by utilizing the remaining negative and positive terminals. To increase the overall capacity of your battery bank you would connect the batteries in parallel. In other words, the positive terminals are connected together and the negative terminals are connected together. If you wire two 225 amp-hour capacity batteries together, your small cabin energy storage bank now has a 450 amp-hour capacity. Charge controllers keep the battery array from being overcharged and they also log data so you can track energy production and usage. Some controllers can also divert surplus energy, for example, if your solar panels keep producing when you’re not at your cabin and using power you can have them divert to a heat sink. 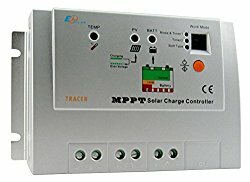 The new MPPT (maximum power point tracking) charge controllers for home use optimize the power transfer between solar panels and battery bank to provide the maximum efficiency in charging. They convert the higher voltage DC output that you get from solar panels down to the lower DC voltage that is needed to charge batteries in your small cabin energy storage bank. You need to ensure that your charge controller can handle the current from your solar panels. To size it, take the total power in watts of your solar array and divide that by the voltage of the battery bank for a rough estimate. As an example, say you have three 250-watt solar panels for a total wattage of 750W. Divide this by your 12V battery bank and this shows that a 50A controller would be the minimum you would use - actually 60A or more would be better to allow for future expansion. Bulk Charge - This is the primary charging stage where the controller allows the maximum current and highest voltage that a battery can accept. Voltage ranges for a 12-volt AGM battery are 14.6-14.8 volts, while flooded lead-acid batteries can be even higher. For gel batteries, voltages should be no more than 14.2-14.3 volts. Absorption Charge - Once the battery has reached approximately 80% state of charge, the charger switches to absorption. The absorption stage is where the charger maintains a steady voltage, while the amperage declines, to keep the battery from overheating. The current continues to decline until the battery reaches full capacity. Float Charge - At this stage the voltage declines to a steady 13.2-13.4 volts and the current drops to a trickle. This will maintain the battery at a full state of charge without overdoing it, and a battery can remain at this stage for months or even years without damage. Smart battery chargers have built-in charge controllers to control the three stages of charging, but since you’re making your own battery charging system you need to provide this important element. You’ve got all this energy you’ve generated sitting in your small cabin energy storage bank, but how do you use it for your 120-volt AC appliances, like a microwave? You use an inverter. An inverter takes 12VDC current and outputs 120VAC current. You hook your battery bank to one side and you get standard household current out the other. 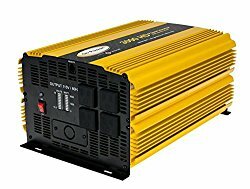 If you opt for a pure sine wave inverter the clean waveform prolongs the life of sensitive electronics by running cooler and you don’t have to worry about whether some electronic devices will work. You will want to match your inverter to the peak load or wattage usage at your cabin. Remember, for peak load, you only have to look at what loads you will be using simultaneously. Obviously you’re not going to have everything turned on all the time, but try and figure out what you might have running at the same time. 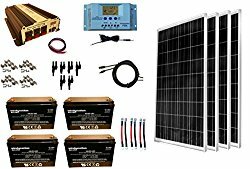 One option is to purchase a complete kit comprising solar panels, charge controller, inverter and batteries. These kits come with all the necessary mounting hardware, as well as the cables required to connect everything together. It's like a small cabin energy plant in a box. By sacrificing your ability to pick and choose each component you gain the convenience and efficiency of having a complete system ready to go, along with all the connections. 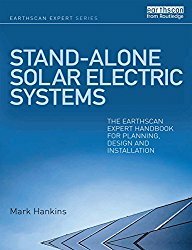 One ot the best, comprehensive guides to building your own system is "Stand-alone Solar Electric Systems: The Earthscan Expert Handbook for Planning, Design and Installation." This is a very worthwhile guide for small cabin builders or anyone who wants to install their own off-grid system. Knowing your options for small cabin energy storage before you build can help you make decisions about your cabin’s power generation and energy needs and optimize your cabin setup.